The message below from Mary Thorpe is in response to our request to visitors regarding more information on the photo above! I am Eileen Margaret Brown of Norwalk, CT, USA. I am the great, great granddaughter of Grace Roy Hunter (daughter of John Roy and Marion McCrindle), b. 1823, and John Hunter (parents unknown to me), b. 1817. Their son, Thomas Hunter,b. 1851, married my great grandmother, Jane Mars (daughter of John Mars and Elizabeth Gemmell), b. 1851. One of their 10 children was Margaret Hunter, my grandmother, b. 1888. She married William Coulter Brown in Maybole in 1909. William Coulter Brown was born in New Jersey, USA, in 1888. His parents were Joseph Brown and Isabella Coulter Brown (daughter of William Coulter and Margaret Brannan) of Maybole. Isabella died in the U.S. shortly after William was born. He was brought back to Scotland to be raised by his relatives, William and Margaret Coulter. My great grandfather , Thomas Hunter, was struck fatally by a train in Maybole on February 25, 1905 at age 53. Jane Hunter and the remaining members of his family (with the exception of son Archibald ) emigrated to the United States, many living in Bridgeport , CT. , including my grandparents, William Coulter Brown and Margaret Hunter Brown, who subsequently moved to Brooklyn, N.Y. where my father, Alexander Coulter Brown and his three sisters, Jean, Grace, and Margaret were born. William Coulter Brown left his family when my father was young, and to my knowledge, there was no further communication. My cousin, Anne Cole, and I are visiting Maybole on May 14 and 15, 2012. We would love to meet any relatives who are still there. We have some unanswered questions - Who was Joseph Brown? Was the Thomas Hunter who was notorious in the agricultural implements industry our great grandfather? Does anyone know more about the circumstances of his untimely death? I enclose a picture of Grace Roy Hunter and John Hunter with their family. Can anyone identify the family members in the photo? 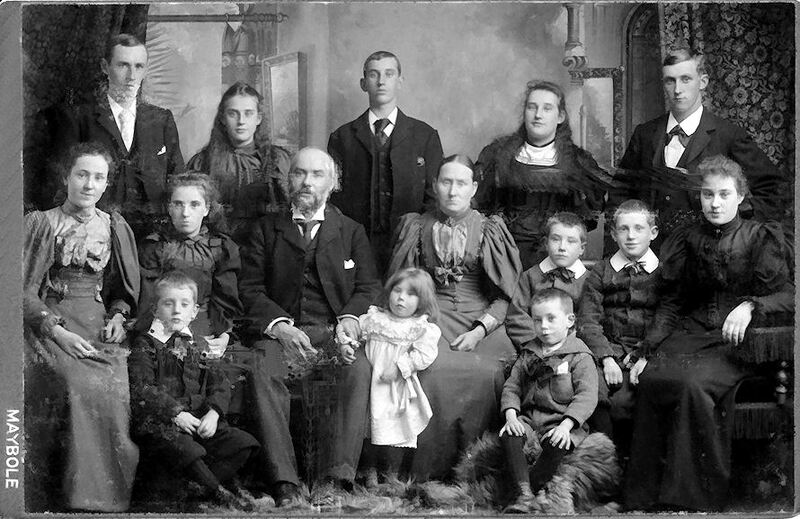 Hunter Family Photo was taken approximately 1895 in Maybole, Scotland. All have the surname of HUNTER. Front Row: Gilbert Roy, Marion McCrindle, George Miller. Here is more information on some of the children in the HUNTER Family photo. I am still gathering information, but this is what I have at the moment. Annie Thornton HUNTER (1881 – 1951): Immigrated to Vancouver or possibly New Westminster, British Columbia, approximately 1913. Annie married George Dawson McKENZIE (originally from Aberdeen, Scotland) in Vancouver on October 14, 1918. Annie and George had 3 sons. Annie died in Vancouver on April 5, 1951 and is buried in Ocean View Cemetery, Burnaby, B.C. George Dawson McKENZIE (1888 or 89 – 1969) died in Coquitlam, B.C. and is buried alongside Annie. Tom HUNTER (1879 – 1945): Immigrated to Vancouver, B.C. approximately 1910. Tom lived in several places – Vancouver (Kitsilano neighbourhood? ), possibly Bowen Island, and died “on way to New Denver from his house at Vallican” B.C. According to the Registration of Death, Tom was single and was a farmer. He is buried in a cemetery in New Denver, B.C. Jean (Jane) Thornton HUNTER (1882 – 1930): Immigrated to Vancouver, B.C. approximately 1914. Jean married Sweany Basil COLSTON (a widower) in Vancouver on March 29, 1922. Believe they had no children. Jean died in Vancouver on January 19, 1930 and is buried in Mountain View Cemetery, Vancouver. Sweany Basil COLSTON was born in Sapperton (New Westminster), B.C. in 1868, and died in Ganges, B.C. in 1949. Hugh Baird Gray HUNTER (1887 – 1936): Immigrated to Vancouver, B.C. approximately 1910. Hugh married Alice Mary FRASER in Vancouver on January 8, 1925. Hugh was a conductor for B.C. Electric Railway (number 12 streetcar). He died in Vancouver on May 12, 1936 and is buried in Mountain View Cemetery. Unconfirmed family information is that Hugh and Alice had 2 sons – Ken and John. Family lost contact with Ken and John during or just after WWII. Alice Mary FRASER was born about 1899 in Winnipeg, Manitoba and where she (and Ken and John) ended up is still a mystery. Gilbert Roy HUNTER (1889 – 1926): Immigration date unknown. Gilbert lived in Vancouver, B.C., and worked for the Union S.S. Co. as a steward. It appears that Gilbert fell ill while working and died just after arriving in Prince Rupert, B.C. on December 4, 1926. His body was shipped back to Vancouver for burial on December 7, 1926. There is no evidence or family knowledge of Gilbert having married or having children. Marion McCrindle HUNTER (1893 – 1986): Marion (Min) immigrated to Vancouver prior to September 1912. She married William James HURL in New Westminster, B.C. on September 18, 1912. She and Bill had 5 children – 3 sons and 2 daughters. Min died in Tacoma, Washington, USA on February 17, 1986. William James HURL was born in Coldwater, Ontario approximately 1889.